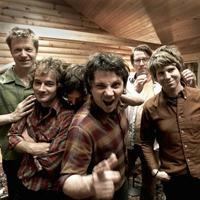 Wilco is an American rock band. When the band first began they were known for their roots in country music, but today Wilco has become an influential group in the American alternative rock scene. Wilco's music is typically categorized as alternative rock and alternative country. Jeff Tweedy, main songwriter and singer in the band, was part of the original band that formed in the 1980s and 1990s called Uncle Tupelo. The band's name comes from the abbreviation of "(We) will comply" used in military slang. Vote for your favorite Wilco album.